Waterfront home on cove. Great Getaway. Three+ bedrooms, three-bath beach house with secluded cove, extra lot for family outdoor games. Tastefully decorated with local artwork. Elegant and simple beach house. Three queen-size beds with down comforters, (also non-allergenic available) one single bed. Upstairs bath off master bedroom has jetted tub and view. WiFi, flat-screen t.v. in living room. Custom-kitchen including dishwasher and microwave and a few condiments. Dining table seats six. Large dining and living area with views to water, cove and islands. Outdoor dining and BBQ supplies provided. Kid and pet friendly. Pets are $25.00 per night. Take your morning coffee and slide into the hot tub which has a view of salt-water bays, islands and mountains. Vacant lot next door offers further privacy as well as extra parking. La Conner offers shopping, Tulip Festival in April, Smelt Derby in February, Art's Alive, The Farm Festival, fine restaurants and antique shopping. 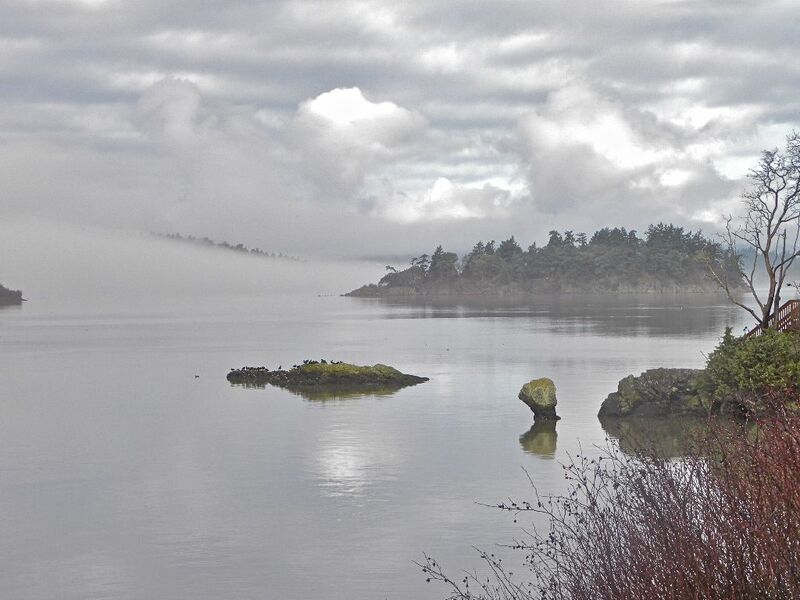 Nearby Anacortes offers many hiking trails and kayak rentals. Anacortes offer whale watching tours. We are kid and pet friendly but we are not childproofed or petproofed. Children and pets must be supervised at all times, hot tub is not fenced. We are not responsible for accidents on the property, use at your own risk. There are kayaks on the property. They are NOT for your use; we are sorry, but the liability is too great. La Conner and Anacortes offers kayak rentals in season. The adjoining lot (for your use) has an access-way to the beach that is public. Occasionally, rarely, it is used by the public. Thirty (30) day cancellation notice. Keywords: Waterfront, Beach Home, secluded Cove, private, large lot, between Seattle and Vancouver, B.C. Having grown up on the Eastern Seaboard as a young child I built this home in memory of living on the beach. Being able to walk to the beach and secluded cove from the deck in less than a minute. The wild bird and animal life from the hot tub. Walking the rural road. toilet, shower, Shower has shelf for toiletries. toilet, shower, across hall from 3rd bedroom. Downtown La Conner, just minutes away - or a nice LONG walk - fantastic restaurants, shopping, view of the Swinomish Channel. Tides go out twice a day. We are "sorta" rural. We are outside the town limits on the Swinomish Indian Reservation in a neighborhood of waterfront homes in a relaxed lifestyle. Distant Olympic Mountains on a sunny day. View to the west of Whidby Island, Tonken Islands, Dead Man's Island, Skagit Bay, Mt. Erie and Olympic mountains. Awesome saltwater bay. Tide rolls out twice a day exposing mud flats (hunting grounds for resident eagles), then a light surf rolls back in bringing seals, ducks and seagulls. Electric, plus wood stove. We provide one presto log. Located in living room. We provide the first Presto log - as well as the first presto log in the fireplace upstairs in master bedroom. You can purchase more at Pioneer Market downtown La Conner. Overlooks bay, has wood stove, flat screen TV and stereo. Large. Since owner uses home from time to time, there are condiments in the door. Help yourself. Coffee grinder, coffee pot, blender, rice maker. Plus bar stools at bar between kitchen and dining. Seats six (6). Plus there is a bar with extra chairs. Large CD collections including classical, country, jazz, blues, latin jazz. Ours are not available. May be rented in Anacortes. Large deck with outdoor seating for four and lounge chairs. View of water. 5 steps into house. Kitchen, dining, living room and bathroom and bedroom on main floor. Extra bedrooms and baths upstairs. Outdoor hot tub with stunning views of saltwater, islands and distant Olympic Mountains. The large lot next door to the north is part of the property and is suitable for outdoor games - football or a picnic. We had a very restful, peaceful time at the this beautiful house by the bay. We loved all the decor and how well this home was presented. Very comfortable and private. I was able to take numerous pictures of the water, birds and sunsets. We even enjoyed the wind storm that blew us around when we went outside. We didn't get to use the hot tub due to the weather but maybe we can next time! :) Thank you SO MUCH for sharing this lovely home with us and our furboys, Sam and Rocky. We would love to come visit again sometime! Except for the first few hours of trying to get the internet to work and no coffee pot, my friends and I enjoyed our stay. The kitchen had enough spices and other things for those who want to cook (we did) and the beds were amazing! You could not ask for a better view.The one disappointing thing was the so called beach. It is no more than 100+ yards long and rocky. At high tide there was no beach and at low tide nothing but mud flats so very difficult to walk on. Judy, the manger, was amazing! She even brought over her own coffee pot as apparently the housekeepers had broken the one there and worked diligently to get internet working. Kudos Judy! Amazing view. Great to have 3 bathrooms. Comfy beds. A vase of roses to greet us. Great space and made use of the wood-burning stove. It would be lovely to have a second set of plates and mugs to use while the dishwasher is running. Worth noting that the hot tub fits up to 4 people. Our bookclub loved the weekend and hope to come back again next year. We had a great time staying at this wonderful home. View was magnificent and had everything! This home is in a great location, on the water, great view, and close to the town of La Conner. In a quiet neighborhood with just a short walk to the beach. The master bedroom has an amazing view of the water and it's own fireplace. Kitchen was large and well stocked with everything needed to cook meals. Loved this place! Excited to come back again. Great home with waterfront views and access to the beach. Very well furnished and stocked home. We enjoyed this place so much that this is our second time renting it. Whale watching, art walks, tramping the tulip fields, great photo ops, and MONA - Museum of Northwest Art, farm tours. Music. Dance. Kayaking.